Journal : Revue de l'hypnotisme et de la psychologie physiologique ; vol. 4. Description : 321-335 p., [3 l. pl.] ; ill.: 3 photo. ; 25 cm. Photographs : 3 leaves, each with a portrait (unverified). Subject : Skin — Dermographism; Hæmorrhage. Reissued: Bulletin de l'Academie de médecine 2. s., xxiii, (1890) pp. 362-380. Abstract translated for Wien. med. Bl., 1890, xiii, p. 215. Author caption: "Par M. Le docteur Mesnet, Médecin de l'Hôtel-Dieu, membre de l'Académie de Médecine." Photo caption: "Fig. 1 — Autographisme et stigmates." Photo caption: "Fig. 2 — Autographisme et stigmates." Photo caption: "Fig. 3 — Autographisme et stigmates." Index Medicus: 120606511280; 20707771490 & 21104831140 (for the Bulletin). Le phénomène extérieur de circulation capillaire, qui se passe sous nos yeux dans l'autographisme, aurait-il son congénère dans un trouble intime et profond de la circulation capillaire du cerveau, trouble que nous ne pouvons constater de visu, mais dont les effets se traduiraient à nous par la dissociation momentanée dans l'exercice des facultés intellectuelles? Je m'arrête devant ce point d'interrogation ! Mesnet's writings on hypnotism and what it reveals about the nervous disorders linked to hysteria are of much lesser importance than those of Charcot or Babinski but he did make a study of the related phenomenon of somnambulism his own. At a time when hypnotism was all the rage in the salons of Paris, Mesnet, much to his credit, labored hard to keep it a science and out of the hands of quacks and sexual predators. This paper faultily identifies a distinct form of urticaria for which he invented the term autographisme, but it does provide an interesting, albeit unconvincing study of urticaria in occurrence with hemianaesthesia. Figure 1 is a photograph of a female patient referred by Mesnet's colleague Dr. Dujardin Beaumetz of Saint-Antoine hospital, her head covered by a cloth and her chest emblazoned with lesions representative of cabalistic symbols. Figure 2 shows the back of the same subject with lesions representative of the date of the photo session (28 Juin 1888). 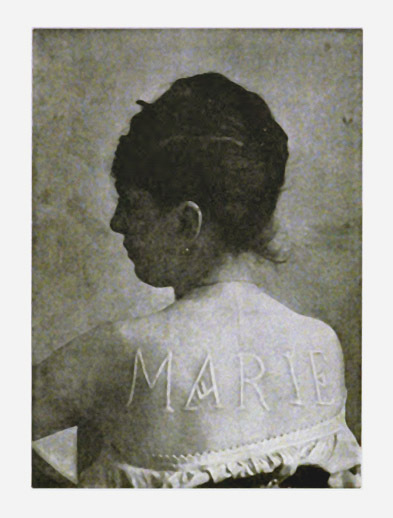 Figure 3. is the same subject again, this time the skin lesions spelling out her name which we learn is "Marie." Mesnet was one of the seven honorary presidents of the first Congrès international de l'hypnotisme expérimental et thérapeutique held in 1889 at Hôtel-Dieu, sharing the panel with Charcot, Brown-Séquard, Lombroso, Richet, Azam and Brouardel.